LifeFear™ – for the low price of self-esteem! Hurry! Since I started writing my blog just 50 or so days ago, I’ve been blown away by how many people have opened up to me and shown me their secret stash of social guilt, low self esteem, fears, confusion, personal battles and possibly the hero of them all – life fear. What is life fear I hear you ask? Starting from my very own blog to the news to the social graph, conversations, advertising and beyond, the world is addicted to achieving ‘self actualisation.’ And those who aren’t addicted to it yet are still exposed to the messaging and it’s just a matter of time. Life fear is the massive knot in your stomach that keeps you awake at night, wondering if somehow your life will be meaningless, without happiness, ambiguous and that you’ll be remembered as a footnote query rather than a bold headline. Life fear is the same type of anxiety known as inadequacy marketing created by the advertising world – without us, you’re probably going to be crap, unhappy, uncool and be riddled with problems – and it will be all your own fault unless you buy our stuff. So people alleviate life fear with material things including expensive experiences all the while living now to pay later. From movies like The Bucket List, to social change websites, music, the news, our Facebook stream, blogs, advertising and more, we are constantly reminded about how short life is, how important finding happiness is and the common need and desire to find ‘purpose.’ It’s a warm and fuzzy feeling and we’re naturally drawn to it because of how we’re wired. Marketers love it, the tech startup world thrives on it and like clockwork, we all keep buying it for the low low cost of our sanity and self esteem. But has it always been this way? Well maybe, but on a much much smaller scale. With the internet and social graph’s intrusive play into our intimate lives, it seems that life fear has gone from being put into your letterbox for your consideration to crashing through your ceiling. 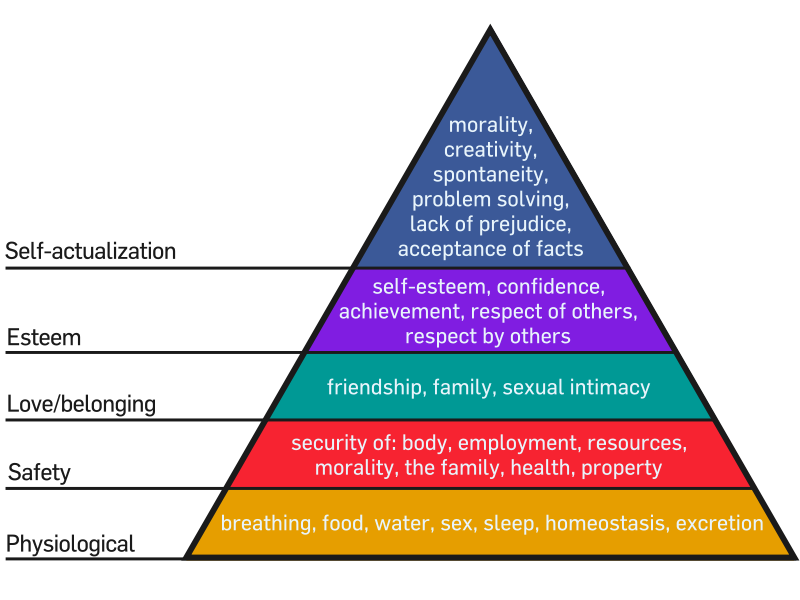 In 1943, Abraham Maslow – an American psychology professor – proposed a hierarchy of needs that studied the ways humans lived, interacted and made decisions. Effectively, it was to breakdown the layers of the decision making process and to understand why some people achieved more than others. Each layer must be masterfully achieved before one can move onto the next level. Here is his hierarchy – yes I know, my first picture in a blog post. Maslow should be so proud. Look at the top tier – Self Actualisation. This is the layer after every other fundamental need has been fulfilled that man/woman works toward achieving full potential. It’s the burning desire to be ‘more’ than what one is and to use our unique brains to do it. It’s the ultimate in creativity, innovation and acceptance. Now look under it – Esteem. The layer dedicated to how people feel about themselves and ultimately feeding their level of zeal to want to self-actualise. Low self esteem? It’s fair to say that you can’t self actualise as a pre-requisite is the ability to accept all that ‘is’ in life – including and especially yourself. Now since inadequacy brands have dominated our lives in a much more mainstream sense than our ancestors (fashion, beauty, status symbols etc), we have been sold self esteem for just an easy monthly repayment, interest free or in the form of a coupon. This then tricks the mind into believing that it’s all-systems-go onto the path of self actualisation! Hooray I feel great with my new BMW – esteem, tick – now it’s time to find that full potential. Then why do so many people with BMWs stay somewhat ok in life but never really go on to be as great as they imagined to be? Maybe, just maybe, you can’t cheat the system on self-esteem despite what an advertising campaign says. So where has it all gone awry? I remember my great grandmother (who lived until she was 98), telling me about her time growing up. She lived before planes, before cars, before television, before the lightbulb, the internet, the mobile phone, penicillin and a host of other things. It’s pretty incredible to think that she lived through effectively the biggest changes of our modern day. She ate red meat, drank red wine, drank full cream milk, ate full fat butter, worked in the sun all day and played music at night. She died of old age not because she didn’t have enough Amino Peptide Technology with Boswolox or spend her time keeping up to the minute on world affairs. When I asked about her secret to longevity, she explained that she didn’t have the stress in her day like we have. Sure, she still had stuff to get done but she only did what she could control and didn’t have to worry about the things she couldn’t. Her day wasn’t filled with thinking about a foreign government’s election, what her friends were listening to, a crime spree in a city far far away, a deal that ends in five minutes, a breaking story, an opinion on something trivial or just the ‘need’ to keep up with the world or get left behind. She could focus on her tasks at hand, live her life the way she felt happy with and she wasn’t reminded every fifteen minutes of the life she was missing out on, the five easy steps to being a better person or being bombarded with messaging to create, solve and sell her an inadequacy. Was her life more or less meaningful? Was she more or less fulfilled? Was she a better or worse person? Who are any of us to judge? Now, I realise that all reflects the story of a time gone by. We live in a different world now and the reality is, technology has a wonderful contribution in our lives despite its problems. I’m not asking you to unplug your modem, to riot against Facebook or to even ignore the messaging. I’m asking you to be aware of it, to understand it, to willingly choose. Realise that we all want to self actualise – to feel more creative, to be ‘happier’ and to have a greater sense of peace. Just don’t be ashamed that it takes some steps to get there and the one right below that you have to master, is self-esteem. You can’t and shouldn’t short-cut it. It’s ok to feel inadequate and to then do things that help you genuinely overcome it. It’s not ok however to think you need to buy into life fear, because it will impair your judgement. Stop comparing yourself to everyone else and just master yourself. Once you truly master your own self-esteem, only then can you rise to the next level and change the world. You see, changing the world and living a life of creativity, congruence and peaceful fulfilment isn’t to serve your self-esteem; it’s because of it. Previous Previous post: Yay you made a big decision! Now what?